Yellow Dog Trucking is extremely pleased and honoured to become the first Intermodal Carrier accepted into the "Partners In Compliance" program. Yellow Dog Trucking has acquired its Long Combination Vehicle (lcv) Licence. Yellow Dog Trucking has obtained the Certificate of Recognition (cor) which is awarded to companies who develop health and safety programs that meet established standards. 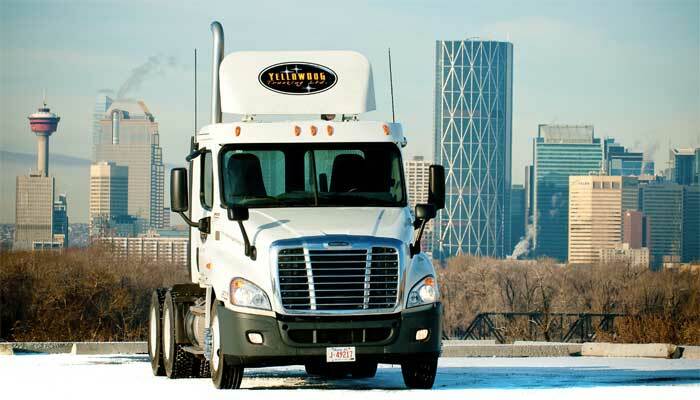 Yellow Dog Trucking has now doubled our yard space in both Calgary and Edmonton. A second secure yard has been acquired in south Edmonton. With yards in both the north and south of Edmonton, Yellow Dog has dramatically improved our efficiency and ability to service our customers needs. An additional secure yard has also been added in Calgary, allowing us to accommodate our growing client base. Yellow Dog Trucking clients can now gain access to monitor all of their shipments on line. Our unique software program allows our customers to track and trace all of their shipments through a secure log-in. All past and current orders can be searched with pertinent information being updated continuously. You will never again need to wonder about the status of your containers. Any and all relevant documentation (Rail interchanges, POD's, Invoices, etc.) can be easily and quickly retrieved for your files. The Web Access function also allows customers to request rates and submit tenders on line.